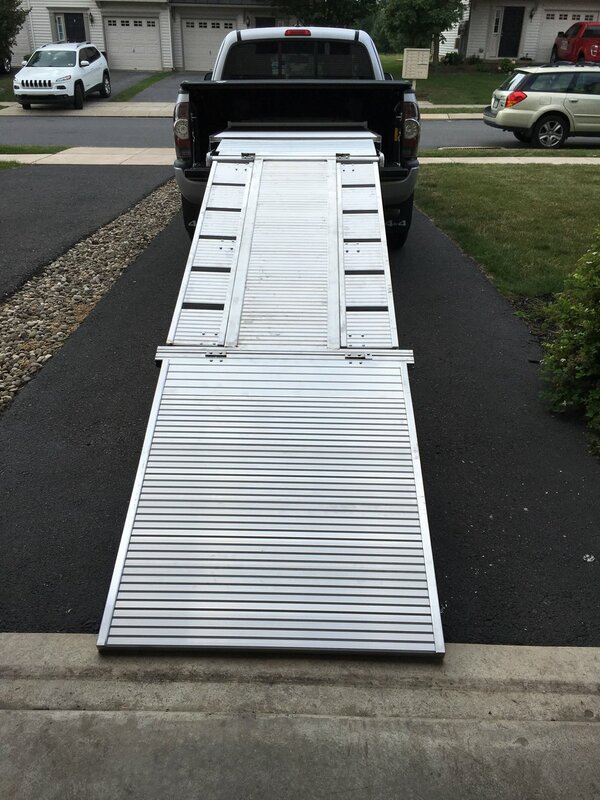 After selling the small motorcycle trailer, and researching for over a year, we decided to go with the load all system for getting motorcycles into the bed of a pick up. It was much cheaper than any of the automated systems, and simpler. They also made a model specific for midsize trucks such as the Tacoma. I had to drive about an hour to the nearest shipping depot in order to pick it up, and had to disassemble the pallet that it came on in order to fit it in the back of the truck. The installation was deceptively simple, only requiring two people at a couple of points along the way. Measurement was the key element. Measure twice drill once. There were a couple of spots where the drilled holes were not in the ideal location beneath the bed. Load all had anticipated that with some large washer plates that resolved the issue. In the end, it all fits nicely in the bed when not in use. However, it does take up a considerable amount of storage capacity under the bed cover.